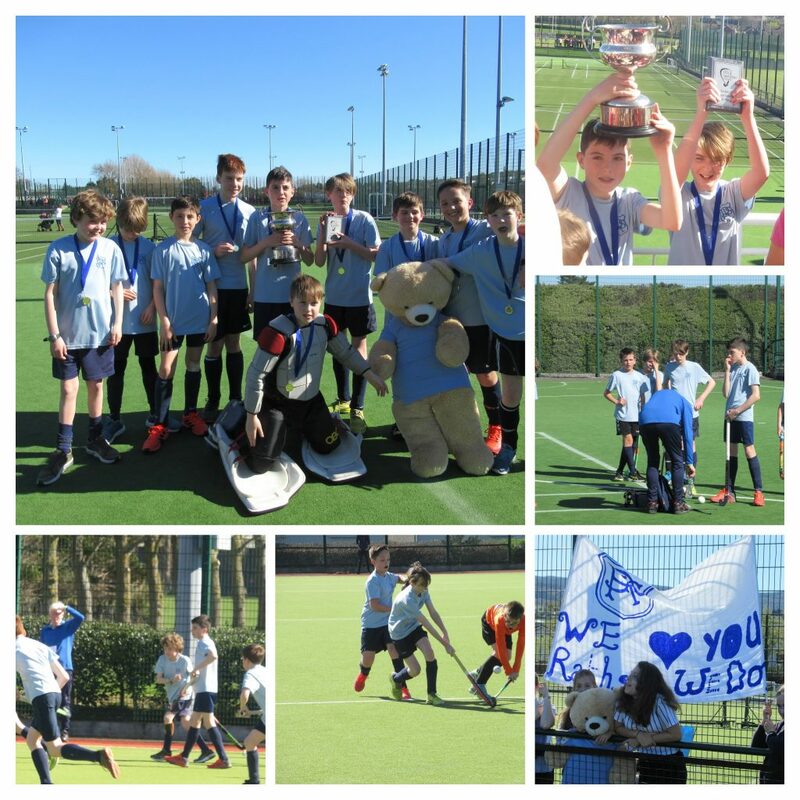 This afternoon the RJS Boys Hockey team secured a wonderful League and Plate double triumph, providing great memories for all who attended. At a sun-soaked Wesley College, the atmosphere was electric on Leinster Finals Day as our buses full of fans and players arrived ahead of the game. RJS’s opponents were a very strong team from Rathmichael National School; both sides having shared the spoils in a 1-1 draw earlier in the league season. 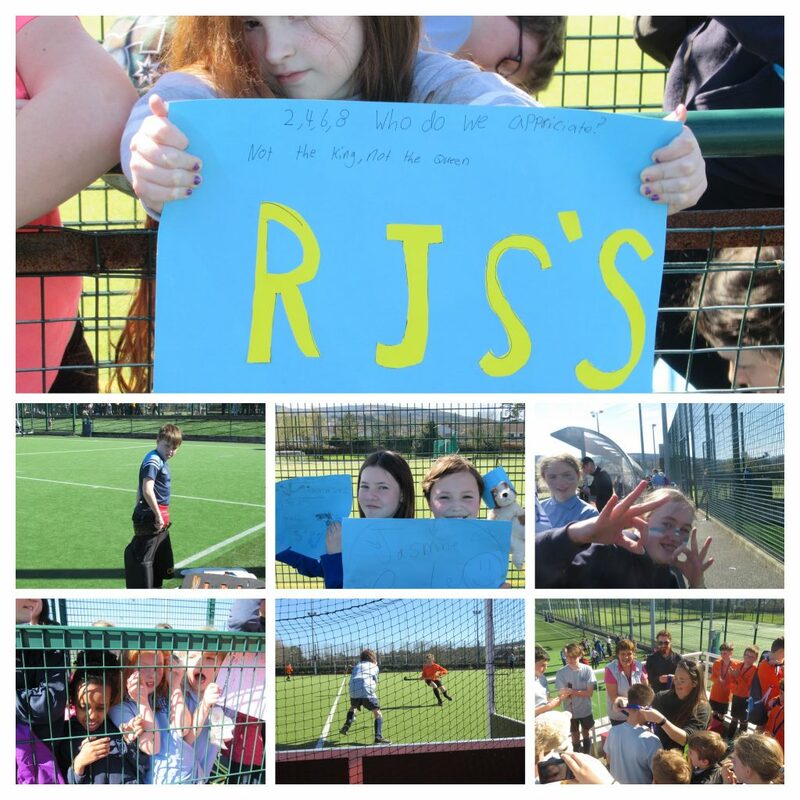 In the build up to the match, huge numbers of RJS supporters had taken great trouble to create banners, placards and signs, with all children from Forms Two to Six cheering on the boys from the warm-up through to the final whistle. A tense first-half finished goalless, with neither side creating too many clear-cut chances, although Naoise was called on to make a few crucial stops in goal. 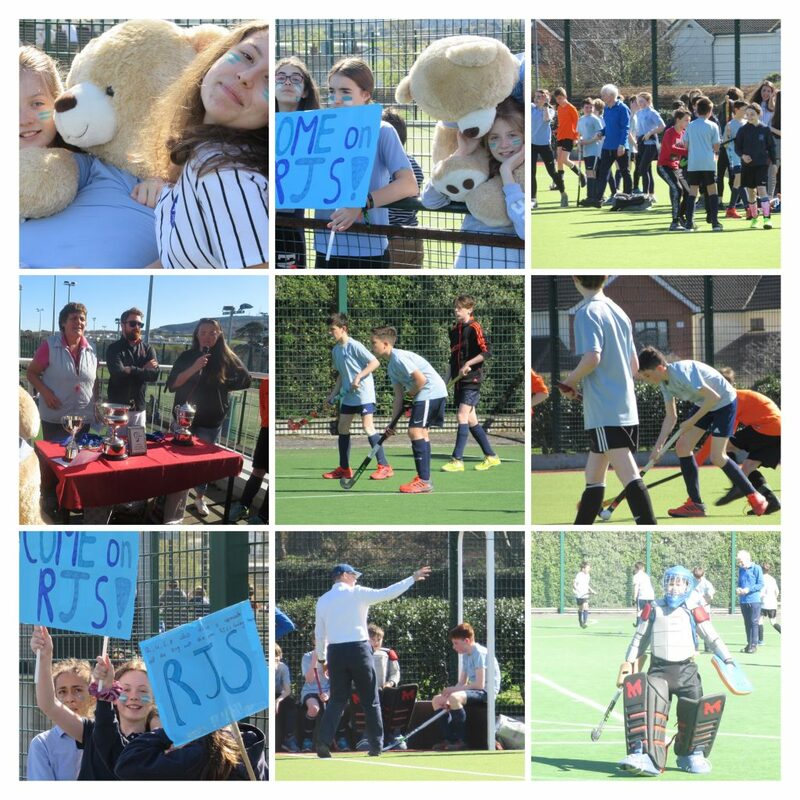 The RJS players were pleased to get to the break on level terms, with the opportunity to re-focus and play the kind of simple, possession hockey which has been their hallmark throughout the season. Another tight twenty minutes followed after the turnaround, with RJS showing the kind of hockey which had already helped us to win the league title. Our defence held firm when called upon, with composed, focused tackling and precise clearances. The midfield and attack also held on to the ball much better and threatened from different areas, carving scoring opportunities of our own. In the end neither side could quite make the breakthrough, meaning the game would be decided by a shootout, just as it had done on our last cup victory in 2012. Five players from each side had to push the ball from halfway into the goal – no easy task, especially in such a big game in front of a nervous crowd of supporters. Although Rathmichael took the early advantage, RJS came from behind to secure the shootout 3-2 and win the title. At a short presentation in the Wesley clubhouse, all the boys from Form Five and Six who had played over the course of the season, joined the celebrations as Zach and Donncha received both trophies on behalf of their team and coach, Mr. Fitzsimmons. Congratulations to all the boys on such a wonderful achievement. They were well-led all year by their captain and vice-captain; but it has been a massive team effort and we are really proud of them all. Commiserations to Rathmichael on coming so close, they made it a great final to play and watch. In the end we all left the glorious sunshine of Wesley, thrilled for boys’ achievements and filled with memories to treasure for years to come. Thanks to Mr. Fitzsimmons for his support and all the parents for all their lifts and encouragement throughout the year! !